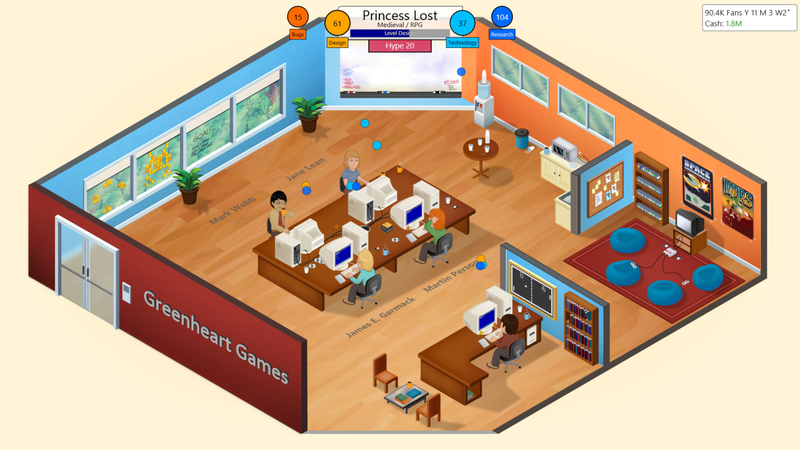 Game Dev Tycoon is a business simulation game that was developed by Greenheart Games. It was released on December 10, 2012 for Microsoft Windows, Windows RT, Mac OS X and Linux. The premise of the game is that you are starting your own video game development company in the 80s where the gaming industry initially started. The goal is to create best-selling games, research new technologies and new game types and become the leader of the gaming market. Initially, you start in the early 1980s in your garage with no employees, limited money and a limited amount of choices. As you make more games and gain more money, more options are unlocked such as new consoles and the ability to create your first game engine. With making more games, you will gain more research points to research new topics and choices and your game development skills will improve. After amassing over $1 million, you can upgrade to a new office and starts hiring your first employees which can help you make better games. After making more hit titles, you will be able to move into even larger offices and hire more employees to develop more larger and sophisticated games. When you are creating your first game, you have to think of a name, a genre and a topic of choice. Each genre and topic combination has different effects on the sales of your game. Next, you are brought to a menu of choices where you can adjust the bars to match what you think the game should include. In the first stage, you have to adjust the time spent on the engine, gameplay and the story/quests. The next stage includes the dialogue, level design and AI. The last stage includes the world design, graphics and sound. The amount of time spent on one aspect versus another can affect how your game would turn out. When you are finished, you will see how reviewers rate your game and how much money in sales have you made and you have just created your first game. With Game Dev Tycoon, it is closely similar to Kairosoft’s Game Dev Story but there are many aspects which is vastly different which includes the ability to change the amount of time spent on different aspects such as the engine versus the gameplay. It is currently available on Windows, Windows RT, Mac and Linux for $7.99 at http://www.greenheartgames.com/and a planned release on Steam will be available on August 2013. Brian Mac is one of the writers and reviewers on The Game Reviewers ( http://www.thegamereviewers.org/ ). To read more reviews on video games, please click on the link to the website.